India has started banning most File and Video sharing websites. Currently around 15 popular File and Video sharing sites are banned by all ISP of India. The list of banned sites can increase. Below is currently banned sites in India. When you open any banned website, you will get following message. 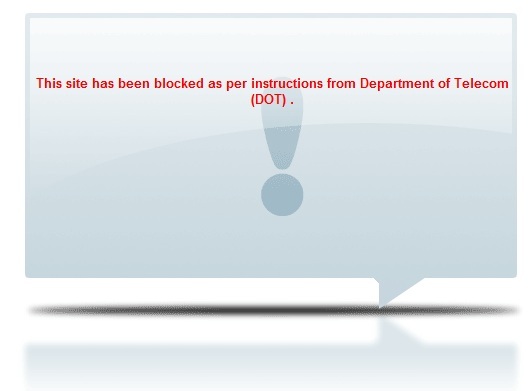 This site has been blocked as per instructions from Department of Telecom (DOT) . You can still surf these blocked sites using any proxy or Opera Turbo. Using openDNS or Google Open DNS will also not work as its completely banned by ISP. The banned has been implemented by Department of Telecomm (DOT), India. However, there is no official announcement by DOT, India about ban and reason why these sites are banned. All sites listed above except Mediafire.com are now opening on most ISP. If you are still getting blocked message, try clearing browser cache, DNS cache and use Google Open DNS. If nothing works, it means those site are still blocked by your ISP. All sites listed above including Mediafire.com are now opening on most ISP. Found those site open to download at night. Yes, you can use proxy or Opera Turbo to surf these banned sites. Can you recommend some proxy sites,please ? Can you please advise what proxy to use ti surf these sites ??? Sorry I do not use any proxy site. So, I cannot advice you any particular. But you can find hundreds of proxy sites from Google search. Better use Opera Turbo. Its safe and ad free. India will never let grow new geeks and when India will start being victim by surrounding countries there will be a single way recruiting geeks from abroad.